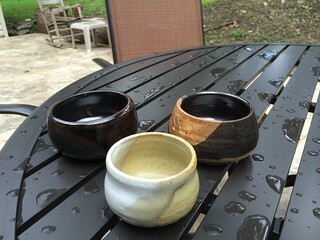 Here’s a look at what’s come off my pottery wheel these last few days. I’ve been practicing this particular shape, which finally jelled a couple of days ago. I hope you like them. Here’s a look at a new mixed media art journal cover I started working on today, after a false start with blue paint and stencils that I knew I hated, all the while painting and stenciling, convinced that “with just a little more paint, I’m going to fall in love with this project.” NOT! So, with trusty gesso and brush, i reduced the cover once again to the clean slate and started again, this time with different colors and without a fixed plan, decided to use the technique that has proven to work really well for me in the past – using colors I love and letting my intuition tell me what’s working and what’s not and then just going with it. Want to know the best lesson art has taught me? It’s taught me that what I create is mine, and being mine, i can do what I please with it. So, like today, if something just isn’t working for me, i can cover it up and start fresh. It’s totally up to me, to do as I please. This is my mantra: If I like it, then it’s perfect. Gessoed to cover what I did previously and then started sponging acrylic paint over cover then going back and adding black and white accents. This one’s not even close to being finished. I plan to do lots more with it – stamps, stencils, collage paper, stickers, handwriting. By the time it’s finished, who knows how many layers will have been added! Keep watching this blog, who knows what it’s going to look like when it’s done. Gotta say I’m loving the grunge look. 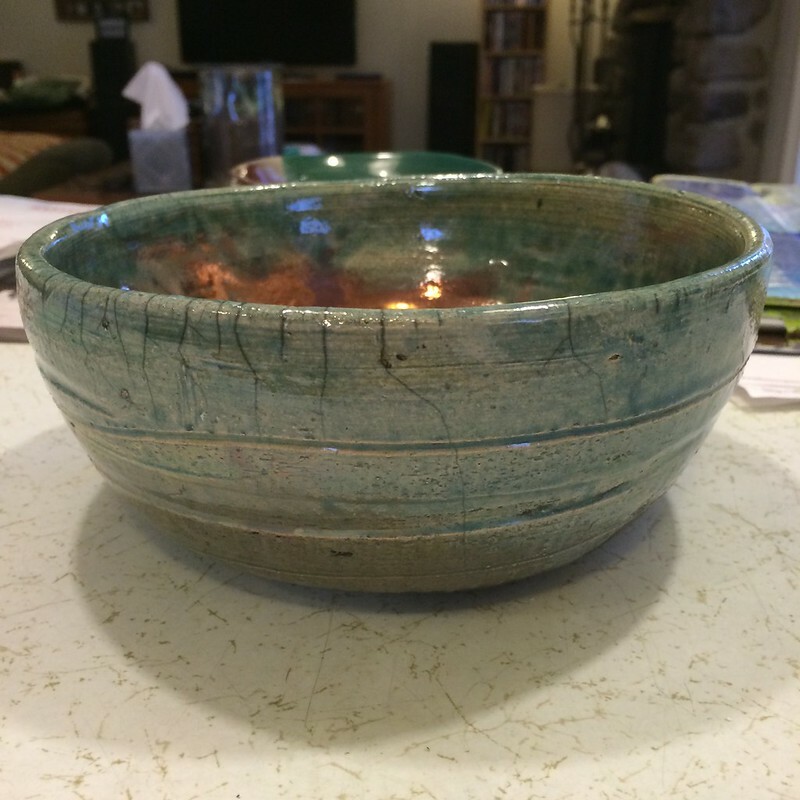 This morning at 5:30, even before my feet hit the floor (I’m an early riser) I remembered that I somehow forgot to add the photos of a raku pot I mentioned in this post’s title. Duh. So here they are, better late than never, they say. From where I sit, these pics are huge! Don’t forget to drop by my blog Wednesday to add your link to Watcha Workin’ On. Remember, it’s open all crafters/artists, whatever your medium. Can’t to see everyones projects! This photo is so totally cute, so totally Sprout, I have no words….. This little guy started out as pinch pot practice, then it grew on me and I added some coils and I just this second saw a funky face on it. Does anyone else see a face? Not sure I like what I’m seeing. Freaking me out a little to be honest. This one slid in under the radar, for some reason, I have no notes on it at all, so I have no idea what it’s glazed with. Salt celadon, maybe? The top two are spray inks, the bottom left is watercolor and Pitt pen and the right is Pitt pen and Copic marker over watercolor. By the way, I finally broke down and got a couple of Pitt pens and I love love love them! They’ve totally lived up to my expectations, why did I wait so long??? 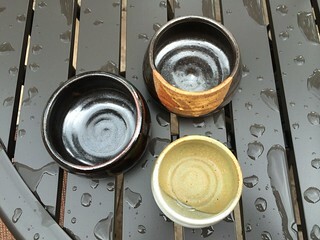 They had a big firing at the pottery studio last week and two of my pots made it into the kiln. Both turned out really well, but one is amazing. Funny thing, working with clay. Sometimes mistakes turn out to be the best pieces. I’m not sure what happened to this pot, I think I bumped it when I was taking it off the wheel and having a really thin spot didn’t help, so it sort of collapsed. I really liked the shape, though, and decided to keep it. The shape reminds me of a calla lily. For the glaze, I did a total dip of Rhodes Turquoise with a rim dip of Tin Purple. I can’t remember what glaze I used for this pot and I left my notes at the studio. I have to run something back to the art center, so I’ll duck in and grab my notebook while I’m there. This pot isn’t as “catchy” as the other one, but I love its simple lines and that it has just enough texture to make the glaze interesting. These are a couple of backgrounds I’m working on, incorporating modeling paste and spray inks. As usual, I’ve been a busy bee and have a new knitting project on the needles to share tomorrow, stay tuned! So ready to get in there and sling some mud! The long promised winter weather is here. 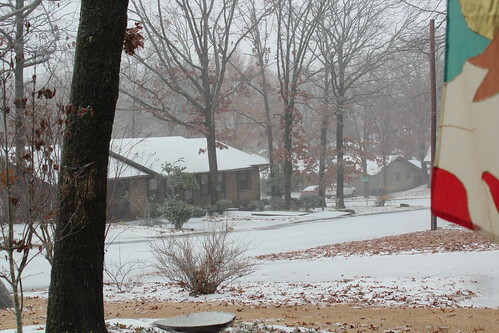 We have the trifecta – sleet, freezing rain and snow. It’s a perfect day to hunker down, drink your hot drink of choice and knit or spin or read or (insert your favorite activity here). The Iknead clan is warm, fed and happy. We have a lot to be thankful for. From the Iknead front door. I spent part of yesterday in the studio and pulled my stuff out of the damp box, getting ready to trim. I was surprised at how many pots I’d thrown. I like the way the look stacked. As soon as the weather lets up a little, I’ll get them glazed and fire them one last time. 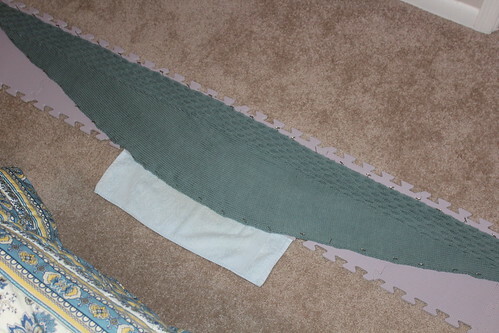 Scapula scarf from Quince&Co, done in Lark, which is 100% American wool, the color is Bird’s Egg. Very, very pleased with both the yarn and the pattern. If you haven’t yet, head over to their website and check them out. Really awesome stuff. This is a really, really long scarf! I’m linking with Frontier Dreams and Tami today. When you’re checking out Quince&Co, trip on over to these guys. Even more awesome stuff.